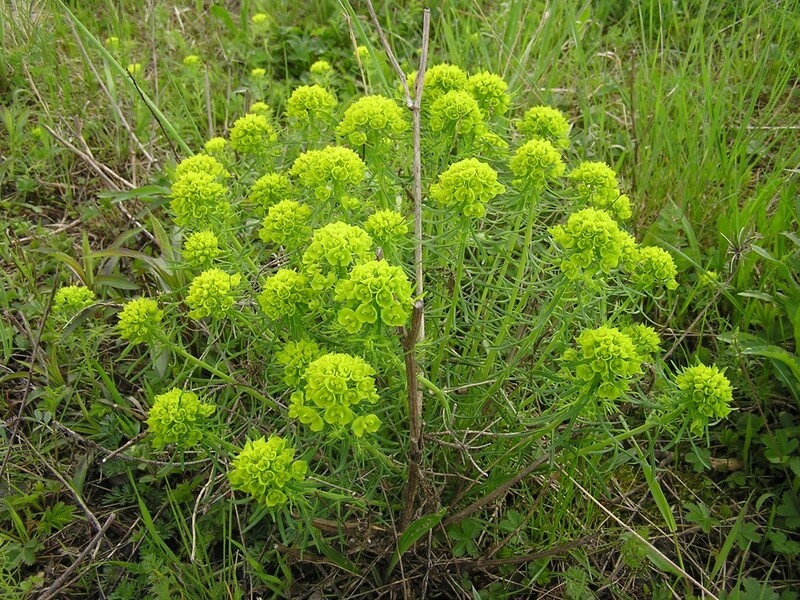 Euphorbia cyparissias is a perennial herb, colonial from rhizomes, tap roots may grow to 3 m deep; roots symbiotic with endomycorrhizae Glomus constrictum and G. mosseae (Stahevitch et al. 1988); stems 15-30 cm tall, sap milky. Leaves alternate linear, to 1-3 long, 0.1-0.3 cm wide, numerous, crowded, in spirals below inflorescence; leaves of infloreacence heart-shaped. 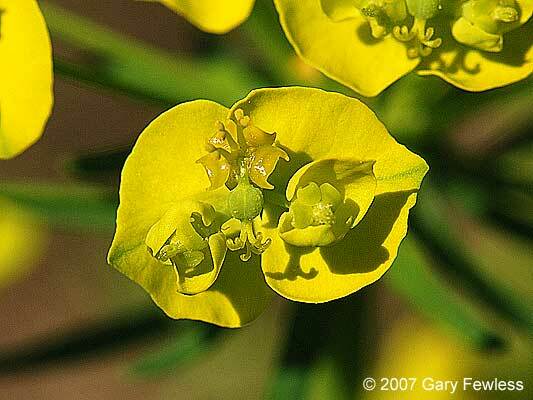 Euphorbia cyparissias flowers. © 2007 Gary Fewless. Herbarium Cofrin Center for Biodiversity. University of Wisconsin Green Bay. uwgb.edu (Accessed 12/2018). Flowers yellow, very small, above two rounded yellowish bracts in umbrella-shaped clusters at tops of stems; flowers highly modified (Stahevitch et al. 1988); rarely fruits. Habitat: Dry, open areas, sandy fill. Very similar to E. esula but smaller, with narrower leaves (Uva et al. 1997). Notes: Plant emerging in spring resembles Linaria vulgaris with similar gray-green, linear leaves but Euphorbia sap is milky (Uva et al. 1997). Invasive weed in parts of Canada. Sap very irritating and waxy cuticle inhibits absorption of herbicides (Stahevitch et al. 1988).